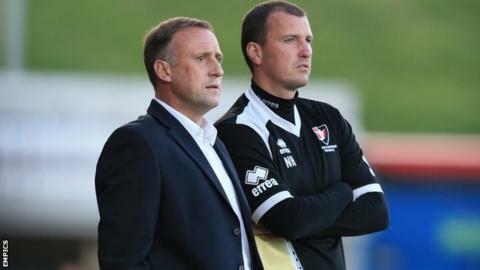 Cheltenham boss Mark Yates has agreed a new one-year deal but assistant Neil Howarth is to leave the club. Yates has been in charge since 2009, making him the third longest-serving manager in the top four divisions. The 44-year-old has twice led Cheltenham to the play-offs but they currently sit 16th in League Two. Howarth will leave when his contract finishes at the end of the season, bringing to an end his eight-year working relationship with Yates. The duo are former Robins team-mates and also worked together when Yates was manager at Kidderminster. "Neil has been a fine servant to our club over a number of years and we are parting with him on good terms," said chairman Paul Baker. "He has played a large role in the successes we achieved over the previous two seasons and on behalf of the club, I would like to place on record our gratitude for everything he has done for us." We believe Mark has earned the chance to put together a new-look team for next season for another crack at it. Former midfielder Yates was Cheltenham captain when they won promotion from League Two via the play-offs in 2002. He started his managerial career at Kidderminster in 2006, before joining the Robins three years later. Yates and Howarth engineered two play-off campaigns - they lost to Crewe in the 2012 final at Wembley and were beaten by Northampton at the semi-final stage last term. However, this season has failed to match their previous success and Saturday's defeat by Rochdale was their 16th loss of the campaign. Speaking in February, Baker said Yates' new deal could be his last at the club. In a statement on Monday, the Robins chairman said: "We appreciate that this has been a frustrating season that has not matched the expectations of the supporters, the management or the board. "However, we believe Mark has earned the chance to put together a new-look team for next season for another crack at it. "The board are of the belief that Mark can recapture those successes and we are committed to giving him that opportunity."